Hello! Over the past weekend Chris and I did some more canning (no surprise there). We tried a new recipe and it turned out to be one that we will make again and again; it was so good! And so easy! I want to share it on the blog today. 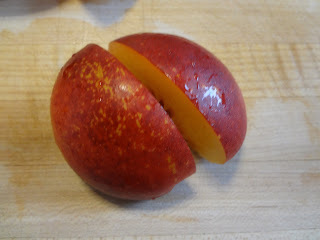 The recipe is for butter spiced nectarines. 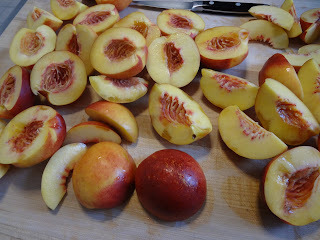 You simply cook the juicy fruit in a bit of sugar and brown butter, just until the nectarines start to soften, add a few spices and that's pretty much it! Once the finished product has been canned you can open a jar anytime and you've got an instant pie filling, an ice cream topping, or a warm and decadent breakfast. 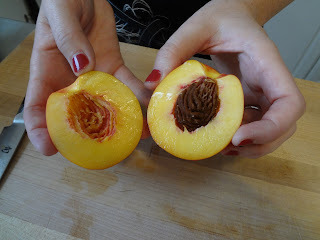 I took lots of photos and I am going to share this recipe as a canning step by step. This easy recipe is short and straight forward, and incorporates all the main elements of the canning process. For anyone that is a canning beginner, I hope this will be helpful. 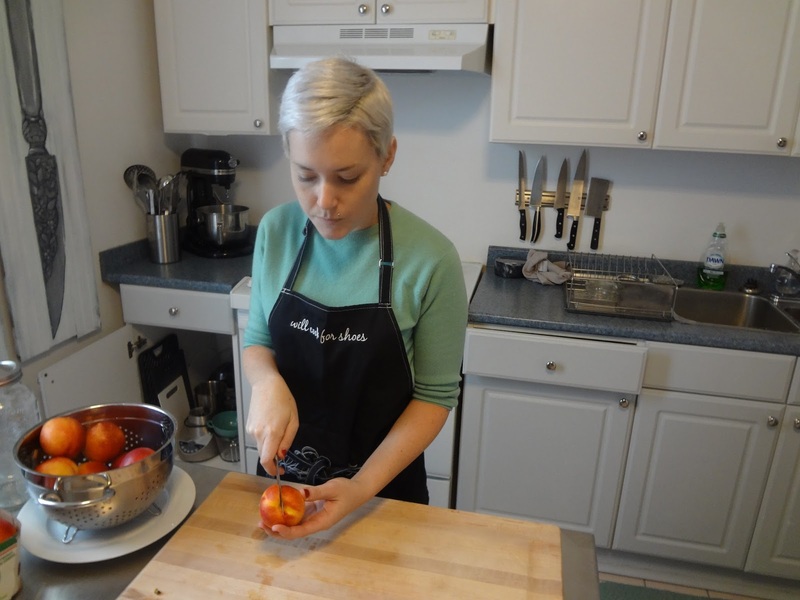 This recipe is so simple that anyone doing it is really free to focus on the actual canning. This fabulous recipe is taken from the book, Can It! (from Better Homes & Gardens). It's another excellent book to purchase if you're thinking about getting in to canning, or if you're an avid canner who is always looking for more interesting recipes to try out. 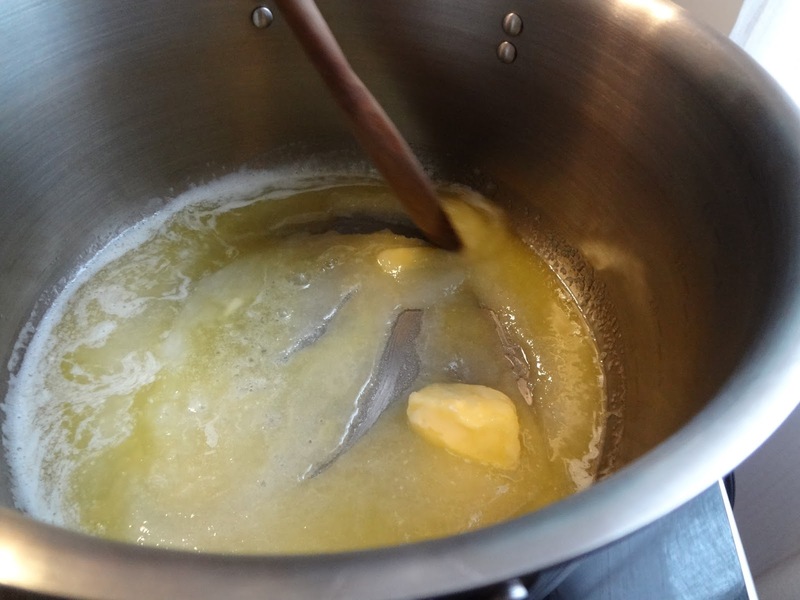 In large pot combine sugar and butter. Cook over medium heat for 5-8 minutes until mixture begins to brown, stirring constantly. Add nectarine wedges to butter mixture, stirring to coat. 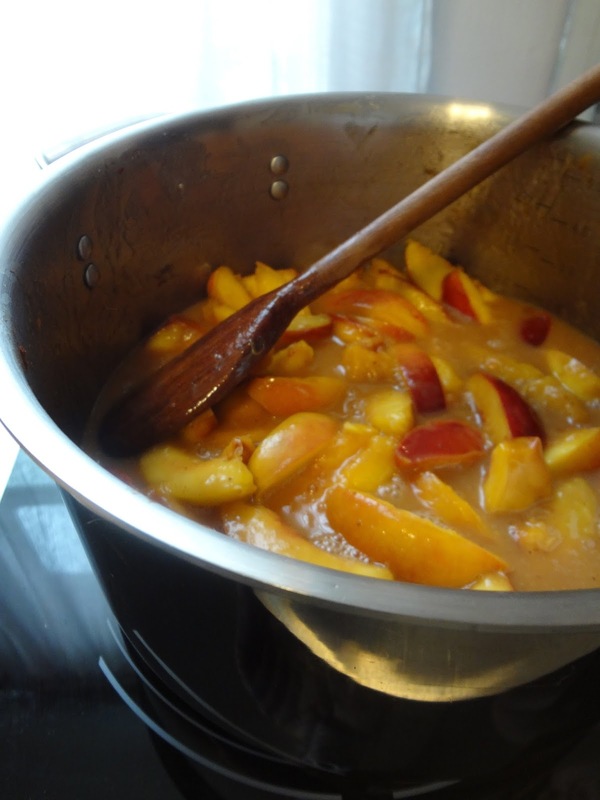 Cook, gently stirring about 4 minutes or just until nectarines begin to soften. Stir in water and lemon juice, cinnamon, nutmeg and clove. Bring to a boil, boil for 1 minute. Remove from heat. Ladle fruit/juice evenly into hot sterlized 8oz jars, leaving 1/4" headspace. 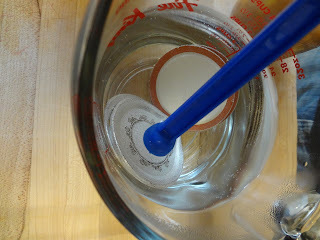 Wipe rims and add lids.Process in water bath for 15 minutes, start timing once water is boiling. 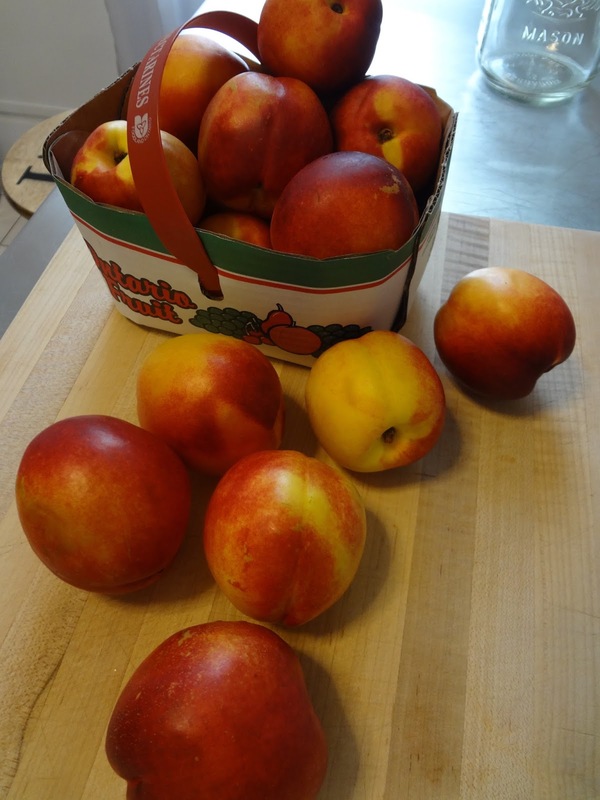 Purchase your fresh ripe nectarines from the market. (It is best to get fruit that is ever so slightly under ripe, otherwise the fruit may be a tad to soft to work with). Gather the mason jars that you wish to use and wash each one with hot soapy water. Leave jars to dry. Prepare your boiling water bath canner. 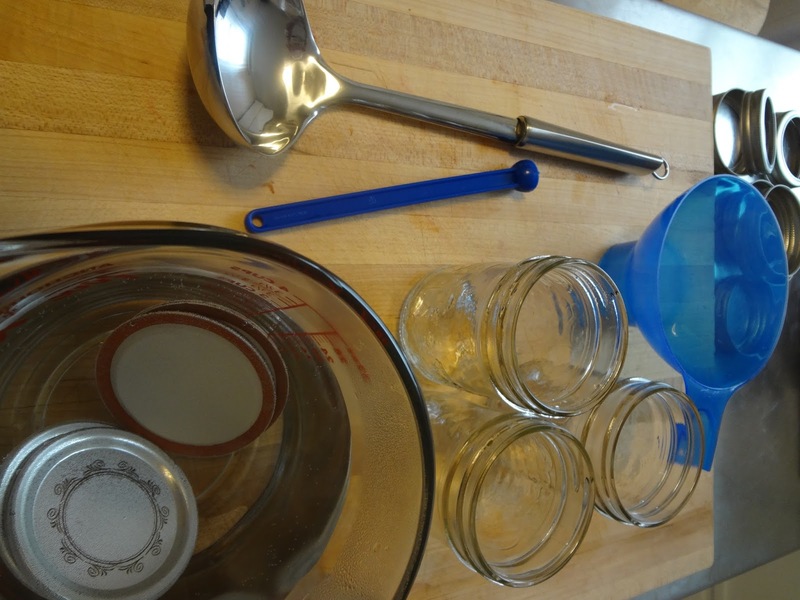 Fill the canner with enough water to cover the jars. 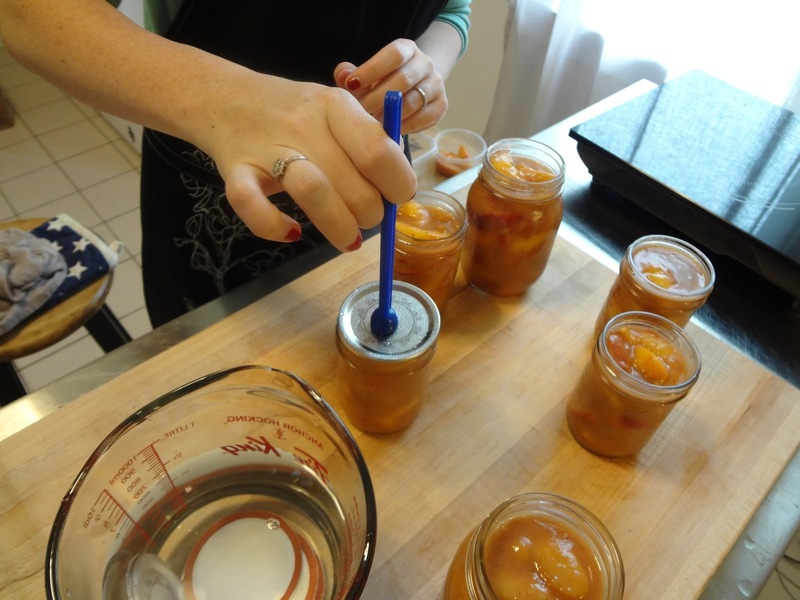 (When the jars are in the canner there will need to be at least 3 or 4 cm of water covering them). Keep in mind when filling the canner with water that the jars will offset some of the liquid. Put the canner on the stove and turn the stove on high. You need your canner to reach a full boil. Wash nectarines and cut in half to reveal the stone. Pry the stone from the centre of the fruit. 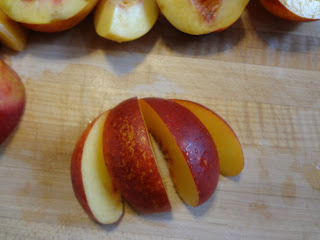 Cut the 'halves' of the nectarine into four quarters. 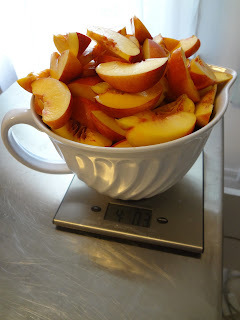 Proceed to weigh the fruit after it has all been pitted and cut. You will need 4 lbs. 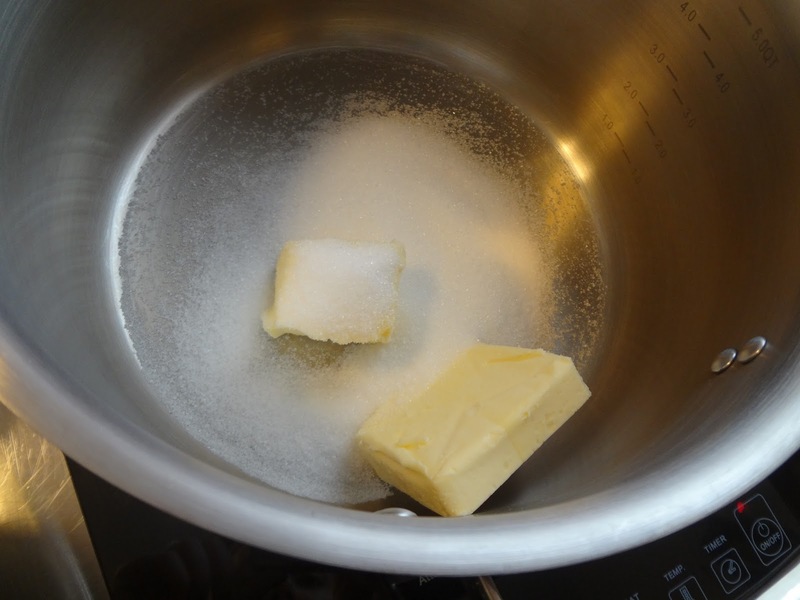 Combine the butter and sugar in a pot and heat on the stove. 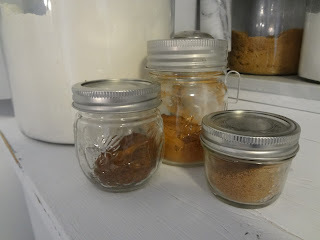 Measure out your spices (cinnamon, cloves, and nutmeg). Set aside. Stir butter and sugar until butter begins to brown (about 6 or 7 minutes). 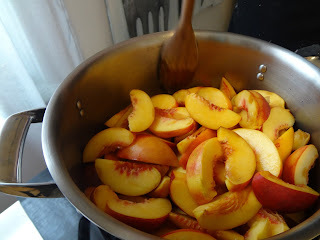 Add nectarines to butter mixture and stir to coat. Sterilize your jars. This is an important step in the canning process. 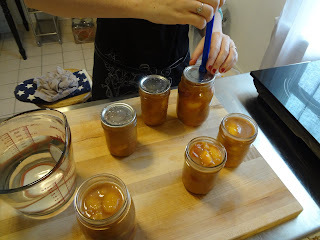 Before your food can go into the jar to be canned, the jar must be sterile and it must also be warm to the touch (because the food will be hot and a difference in temperature may cause the jar to crack). 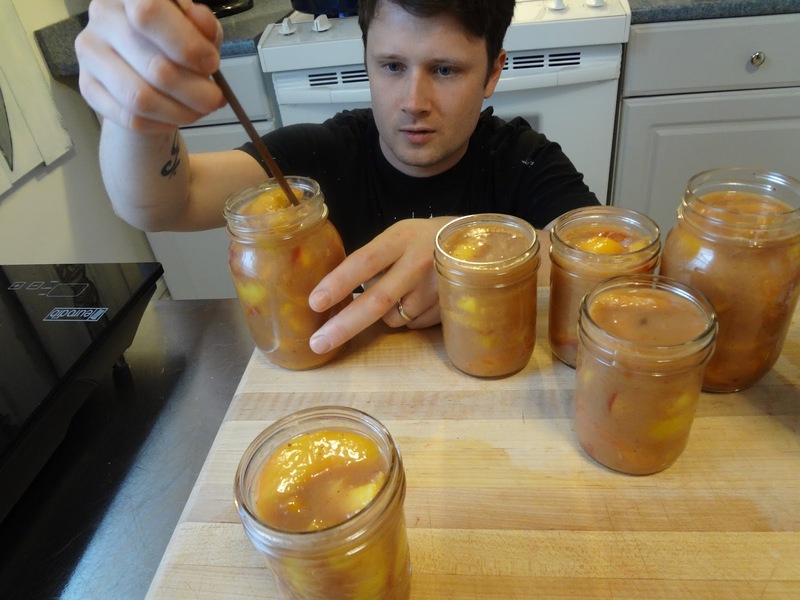 There are many different ways to sterilize your jars. 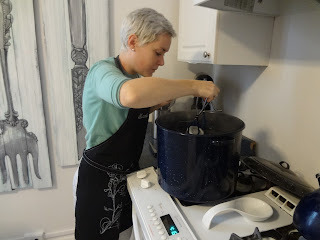 You can use your dishwasher and run the jars through a full cycle, you may use the canner itself, and boil the jars in hot water, or you can use your microwave. 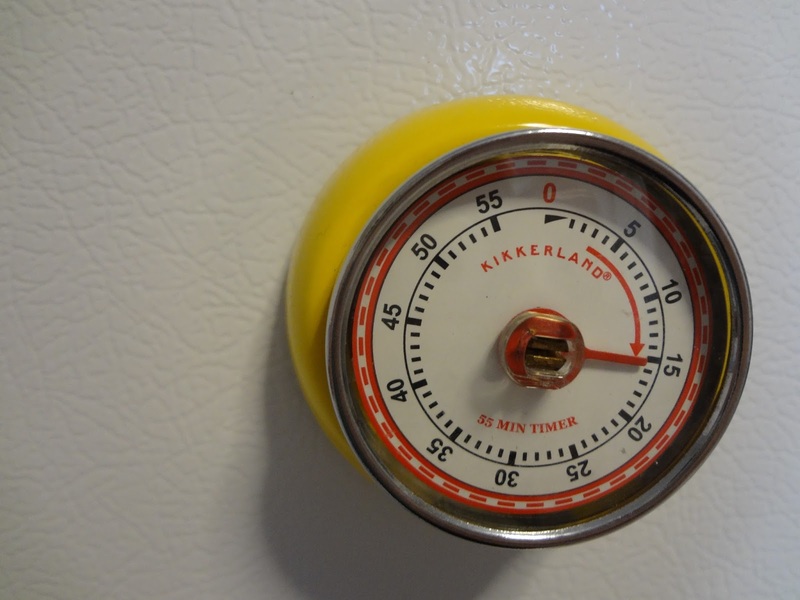 I find the microwave method to be the easiest and fastest. Simply take each jar after it has been washed, and fill it with 1 or 2 inches of cool tap water. Put the jars in the microwave and microwave on high until you see the water begin to boil. (Times for this will vary depending on how many jars you have in the microwave). 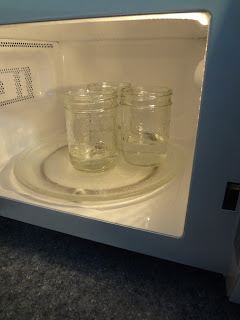 Once the water has boiled, open the microwave and remove jars one at a time. Pour out hot water into the sink and set your jars on a surface that is not too hard. 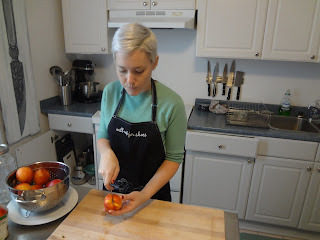 I like to use a wooden cutting board. (If very hot or very cold mason jars are set down on a surface with no 'give' it can cause them to crack). Now you have hot, sterile, empty jars. Go you! Keep an eye on your nectarines. Once mixed with the butter and sugar, they need only to cook until they start to soften (5 minutes or less). You want them to be just slightly stewed, but still firm enough that they keep their shape. Once they are at the desire stage, stir in water, lemon juice and spices. Bring to a boil; boil for one minute, remove from heat. Prepare your lids for canning: Count out the amount of lids that you will need and place them in a heat proof container. 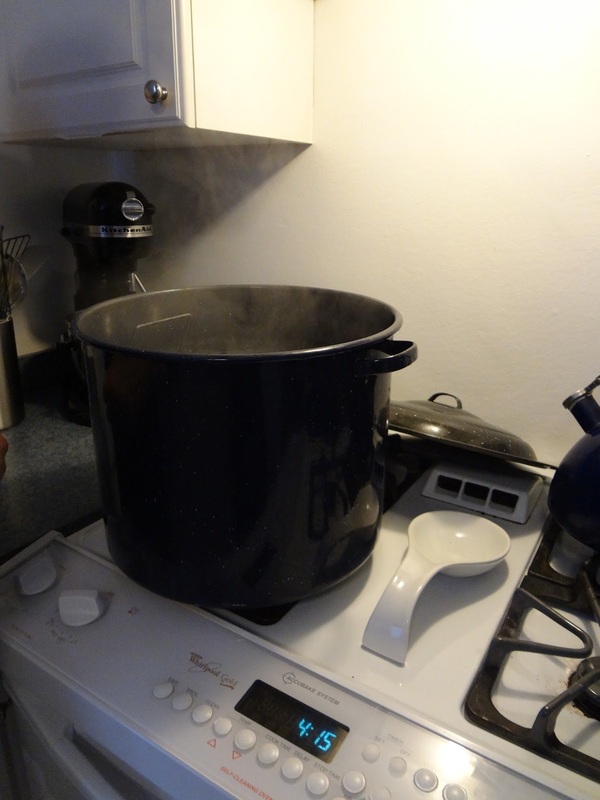 Boil water in a kettle or on the stove and pour boiling water over the lids to cover them. 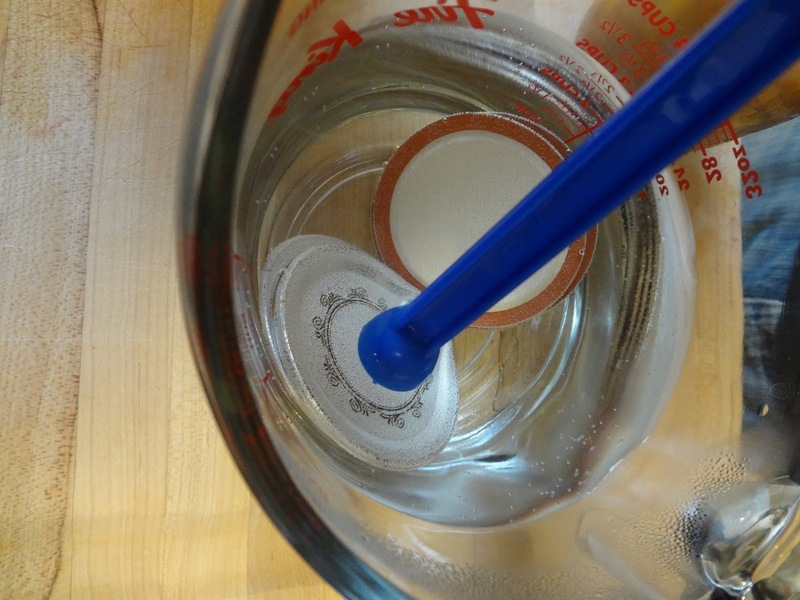 The lids must stay in the water for at least 5 minutes (the hot water softens the rubber on the underside of the lids - the orange ring - and it is this soft rubber that forms a seal between lid and jar). 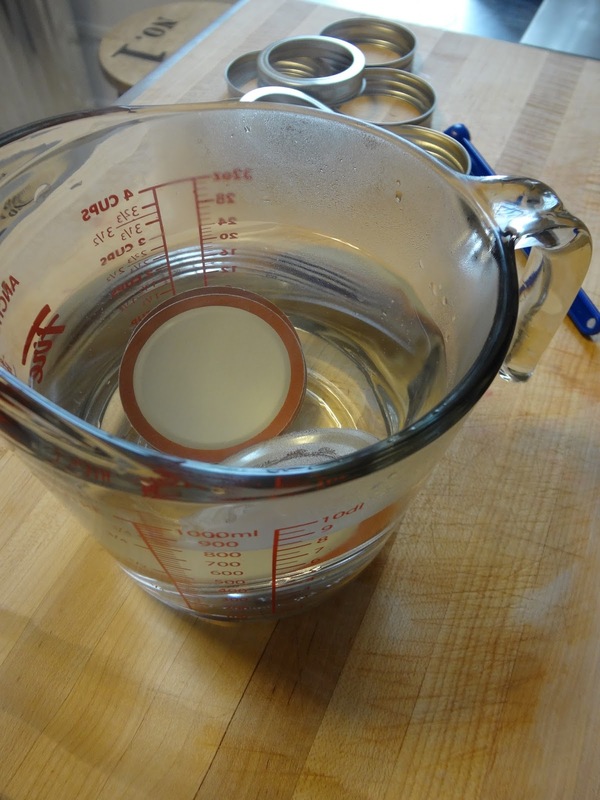 Leave the lids in the water until you are ready to use them. Note: The magnetic wand, canning funnel, and canning tongs can be purchased together as a 'canning supplies package'. I got mine at Canadian Tire, but anywhere that sells canning supplies and jars should sell them. 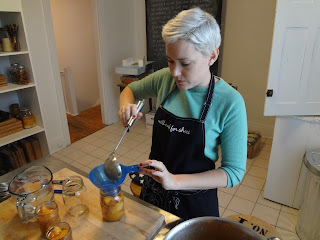 Gather your hot, sterile jars and using a funnel and a ladle, fill them with food. Leave about 1 cm of headspace at the top of the jar to allow for expansion. Remove air bubbles. Once the jars have been filled, use a non-metallic utensil (a chopstick is perfect) to remove any bubbles that may have formed when the food was poured into the jars. An air bubble among the food product in a sealed jar is the perfect place for bacteria to grow over time. This is the reason removing air bubbles is important. The more viscous the food product (ie. salsa, pie filling, apple sauce) the more likely your are to have air bubbles after filling the jars. Less viscous products (ie. 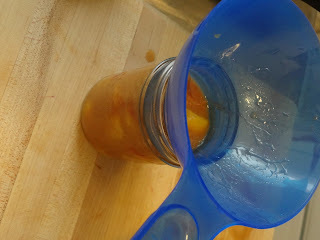 vegetables in pickling solution, fruits in syrup) tend to pour nicely without producing many, if any, air bubbles. Simply run the chopstick through the food, looking for any little bubbles as you stir. This is a simple but important step. Wipe the rims. Before you place the lids on the jars, you'll want to be sure the rims of jars are free of any food product or sticky residue. Simply take a clean damp paper towel and wipe each jar. Place the lids on the jars. Use your magnetic wand to lift one lid out of the hot water. Place the lid directly onto a jar (do not worry if there is a small amount of water on the lid). Screw the rings onto the jars. The rings should only be 'finger tight'. Using only one hand, screw the ring on with only your finger tips. Do not use both hands to tighten the lid as much as possible. If the water boils BEFORE you're ready, great! Just turn down the heat a bit and around the time that you're wiping the rims, turn the heat back up and get it up to a boil agin. If the water boils AFTER you've got all the jars ready and you have to wait for a while, don't worry too much. As long as the jars of food are still warm to the touch (closer to very warm or hot is best) they will be fine to put in the canner. Getting the canner to boil around the time that you are ready to use it can be a bit of a trick, but over time you'll get it down. For this recipe, I would put the canner on the stove and start heating it up at the same time I started preparing the nectarines. 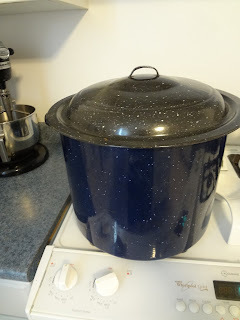 But for longer production times (say, a tomato sauce that has to cook down and is on the stove for 2-3 hours) leave the canner off the stove in the beginning and put it on closer to the end of the cooking process. Plan for it to take 20 -45 minutes to heat up and reach a boil. Of course it also depends what size canner you are using and how much water you have in the canner. After trying out a few different canning recipes, you'll get a feel for when the canner needs to go on the heat. You'll get the hang of it! It just takes some time. Put the jars in the canner. Use your canning tongs to lift each jar and place on the wire rack on the bottom of the canner. 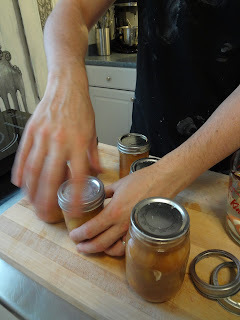 Wear an oven mitt as you place the jars in the canner, the steam can burn. The canner rack should hold around 7 jars. It is good to fill the rack so the jars don't have enough room to tip or slide around. If you don't have enough jars, no problem. It won't cause any difference in the finished product. Once all the jars are in, check the water level. 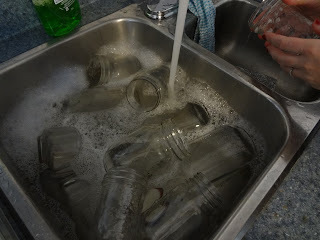 The water must cover the jars by at least 3 or 4 cm (1 or 1.5 inches). 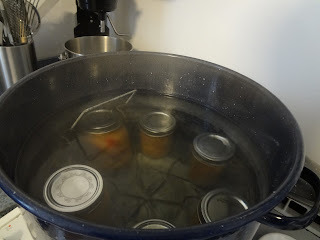 If the water is not high enough, just pour more in the canner. It is a good idea to have a full kettle of hot water nearby just in case. Once all the jars are in, put the lid back on the canner. Wait for the water to reach a full boil, now that the jars are in the canner. 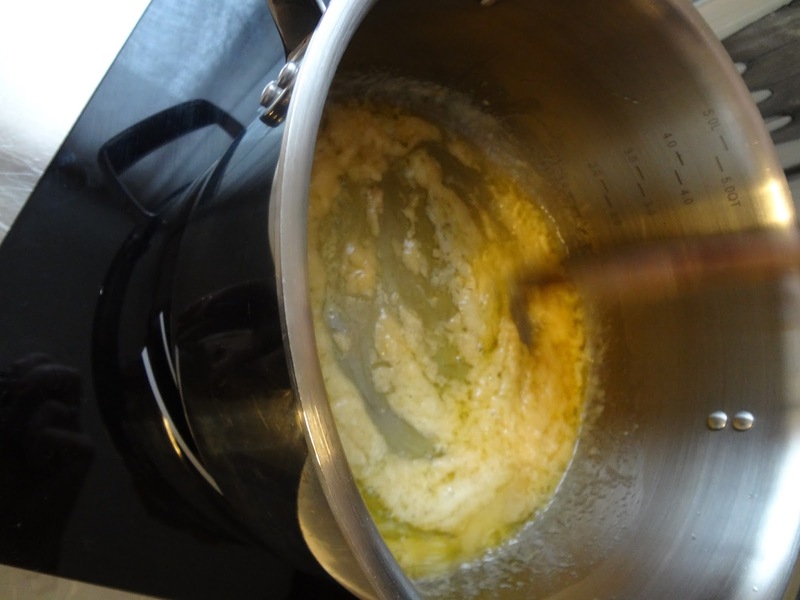 Once the water is boiling, your PROCESSING TIME BEGINS, not before. For this recipe the processing time is 15 minutes. Set a timer and sit back and relax. When the processing time is up, turn off the heat and remove the lid of the canner. Allow jars to rest in place for a few minutes. 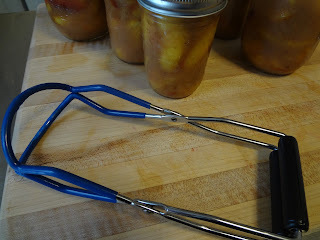 Then remove each jar from the canner and set on a wire cooling rack, wood cutting board, or folded towel. Hard cold countertops can cause the jars to crack. Do not tighten bands. Let the jars cool for 12 - 24 hours. You may hear a small 'ping' as the jars cool. This is the seal forming (it forms during the cooling process). After 24 hours time you may test the seal by pressing your finger on the centre of the lid. It should not give. Store jars in a cool dry place for up to one year. 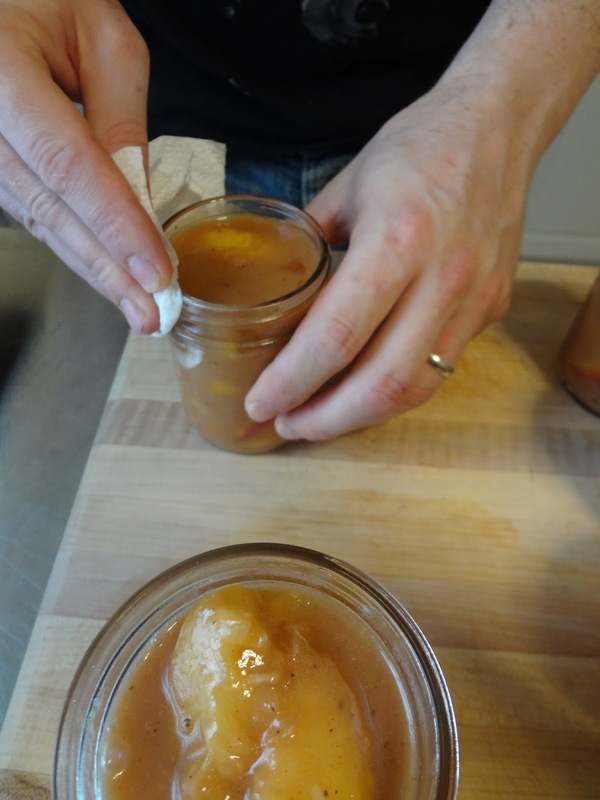 If any jar has a compromised seal, store in the fridge and use within a week or two.